What You'll Need: scriptures, GAK 200: The Birth of Jesus, GAK 203: The Wise Men, Gifts for the Savior print out, writing utensils or coloring tools, glue stick, string, yarn or gold twine. You can also choose to download the pdf of LESSON 50 for easy printing. If you download, please leave a comment here on what you like about this lesson. In December we celebrate the birth of Jesus Christ. Many came to see him to celebrate his birth. Wise men in the east saw a new star in the sky. They knew this star meant the Messiah had been born, so they traveled to Jerusalem. They saw a sign of His birth. A new star. 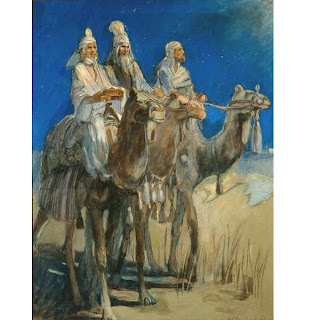 The star led the wise men to young Jesus, “and when they were come into the house, they saw the young child with Mary his mother, and fell down, and worshipped him..."
When they came what did they bring with them? We are going to talk about these three gifts. FRANKINCENSE: Frankincence is a sort of small rock made from resin from a tree. You can burn it and it makes a smoke in the air. People at the time of Christ's birth thought it would make you feel calm, peaceful and happy. Following the teachings of Jesus Christ can makes us feel calm, peaceful and happy. Ancient people burned frankincense, believing it would carry their prayers to heaven. We pray to Heavenly Father in Jesus' name because He is the way we can return to our Father in Heaven. As we celebrate the birth of Jesus Christ we can also give gifts to the Savior. Our gifts will not be actual presents that we buy at the store, but we can give him even more important gifts. We can give him gifts from our hearts. Jesus Christ wants us to be happy and follow his teachings. We can give him gifts by following his teachings, being kind to others or working on something we struggle with. On your card write or draw your gift (or gifts) for the Savior this holiday Season. It is private, no one else will read it. It is a special present from you to Jesus. It can be fighting less with your family, helping mom more, being more reverent in church, stopping saying a word you know you shouldn't say. It could be reading your scriptures, remembering to pray every morning and night or thinking of Him each week when you take the sacrament. It could be sharing a Book of Mormon with a non-member friend. Each time you see your paper on the tree remember your gift for the Savior. try your very best to do what you said you would do. Your heart will be happier this holiday season and so will his. Bear your testimony about the birth of Christ and our opportunity to give him the gift of our obedience. Encourage your children to use this opportunity to write down something and really follow it and that they will be blessed if they do. Practice Song: If you are teaching your family the DECEMBER Song of the Month, go over the words and music with your family. Engage in a family filled Christmas activity together. Make holiday cookies, salt dough ornaments, sing carols. I love this lesson. I just wanted to let you know that when I click on the Lesson 50 PDF link, it gives me the download for the cards and envelopes. Just in case you didn't know! Thank you! I love knowing that I can always rely on you for a quick and AWESOME fhe lesson! We do this every year...gifts for the Savior. Thank for a perfect lesson to go along with it. Loved the cards and envelopes. I may use that idea for lots of gifting occasions. Thanks for a great lesson. This was a great idea - thank you! I have three young kids who LOVE unwrapping presents, so I wrapped up the three wisemen gifts (a gold coin for gold, a rock, etc) and let them open them. Thanks for the great idea! I am going to download this because just the other day my son was asking what the gifts were. Thanks for preparing it. And thanks to Anonymous for the idea of wrapping up the wisemen gifts. Thank you so much we are doing this lesson tonight. 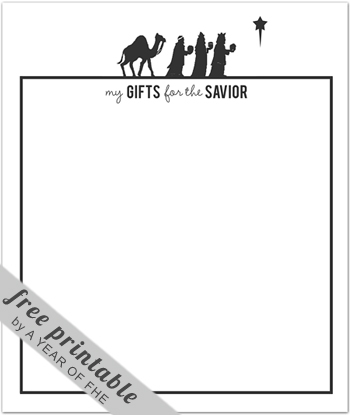 I love the printouts with the wise men on them, great for writing down our gifts for the Savior. Thanks for this lesson, we're using it for Activity Days today! I love that this focuses on Jesus Christ... and includes Cookie Dough! :) Thank you! Love this used it for activity days! I am definitely using this for FHE tonight - hopefully it will help me and my children (6-yo twins in particular) remember to focus on the Savior more during this last week before Christmas, and motivate us all to behave better as a gift for Him. As always, thank you for a wonderful lesson plan! I just stumbled upon your blog and I love it, thank you for sharing this great blessing.